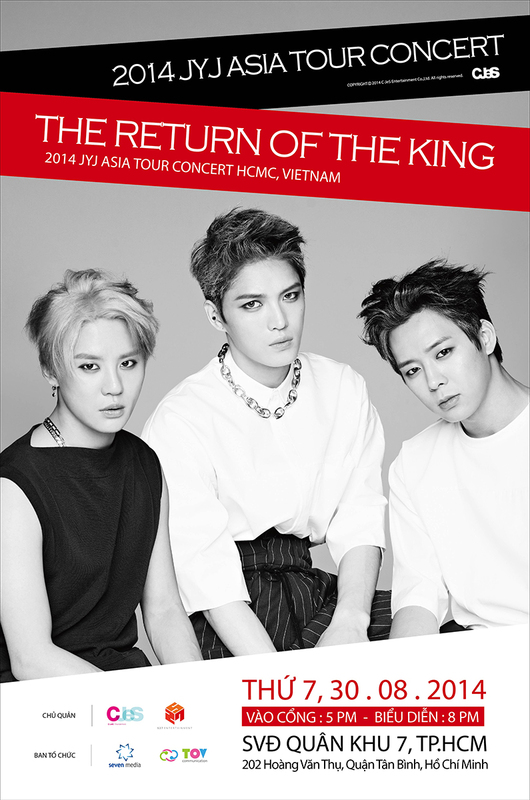 2014 JYJ ASIA TOUR CONCERT was the second international and first Asian concert tour of JYJ. 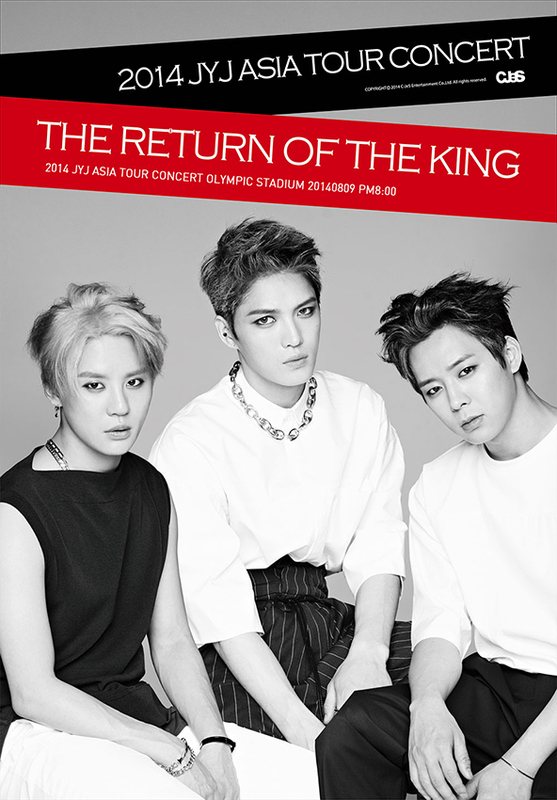 The tour marked the return of JYJ after performing the 2011-12 JYJ World Tour Concert and was organized to support JYJ’s second studio album, Just Us. The tour commenced with a show in Seoul in August 2014 and proceeded with other Asian cities weekly in two months. 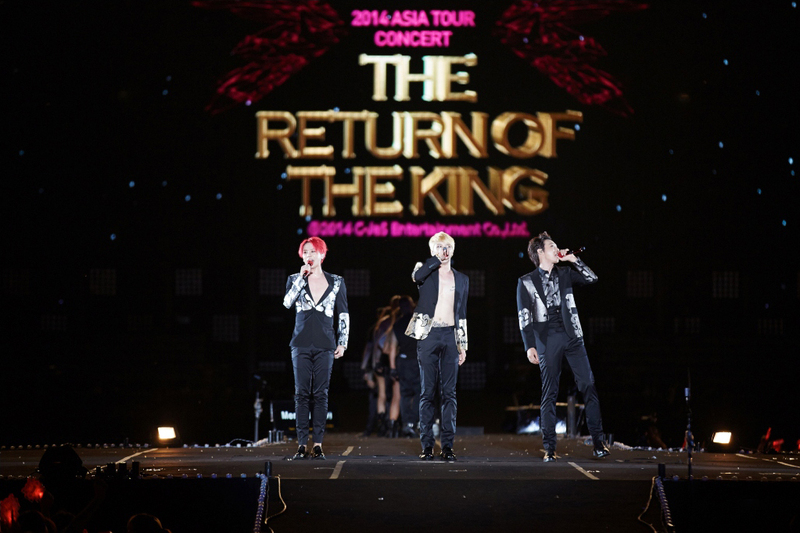 The show in Seoul was titled as 2014 JYJ CONCERT in SEOUL ‘THE RETURN OF THE KING’ and was announced as the sixth highest-grossing tour in 2014 by Interpark. 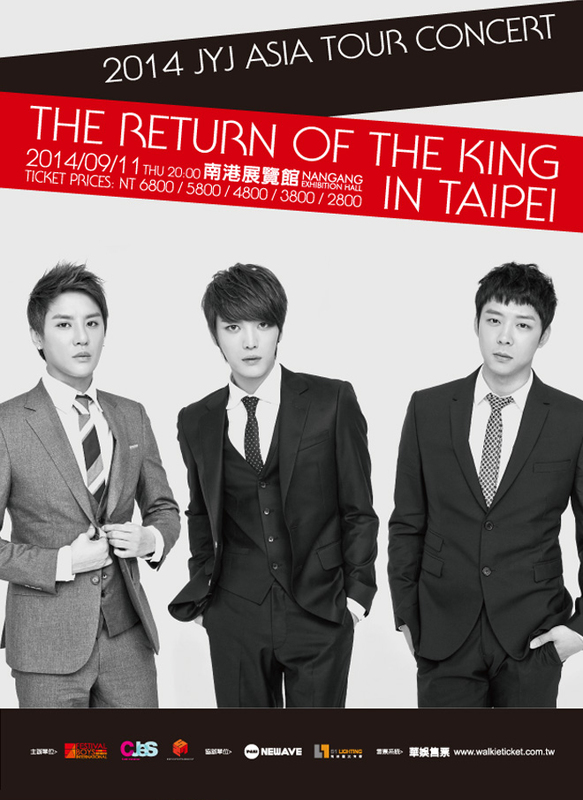 C-JeS Entertainment first announced the start of the Asia tour with the show in Seoul on June 25, 2014 through its official JYJ Facebook page. JYJ performed songs from their The Beginning, In Heaven, Just Us albums, and members’ solo albums including Tarantallegra, Incredible, I, and WWW. The show lasted for about two and a half hours. Rehearsals took place on August 7, 2014 ‘til the afternoon of August 9, 2014 in Seoul Olympic Main Stadium. 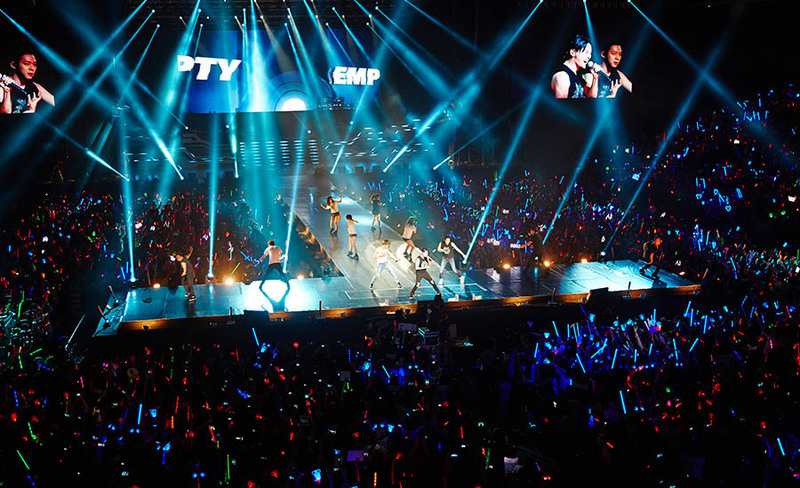 JYJ was supported by 16 backup dancers from the United States and South Korea. JYJ on stage in the Seoul concert. Photo: C-JeS Entertainment. The first round of ticket sales for the Seoul concert was opened to public on July 2, 2014 as announced by Interpark, the ticketing agency for the show in Seoul. The second round started six days later. LOOK Korea was the only exclusive authorized dealer and travel agent for international and Japanese fans. On July 6, 2014, seven more dates were added to the tour. Four of the new dates included stops in Hong Kong, Beijing, Ho Chi Minh City and Chengdu, while Kuala Lumpur, Shanghai and Bangkok were still under discussion. C-JeS Entertainment announced one additional date to the tour for Taipei, and also finally confirmed the Shanghai concert on July 25, 2014. While the show in Bangkok was initially planned to be on September 27, 2014, C-JeS Entertainment later confirmed on August 8, 2014 that it would take place on September 25, 2014 instead. The Kuala Lumpur stop was the only show that did not manage to pull through in the tour and the proposed plan for the show was called off by a local organizer, Jazzy Group, on August 21, 2014. About 25 songs were performed in each show. For the solo performances, Jaejoong expressed his own rock emotion with “Dear J”, “Butterfly”, and “Mine”. Junsu showed off his charm with “7살(7 Years)”, “Tarantallegra”, and a mix performance of “Turn It Up” and “Incredible”. Yoochun sang “서른..(Thirty..)”, his self-composed track “그녀와 봄을 걷는다(Walking With Her In Spring)”, and “I Love You” throughout the whole tour. 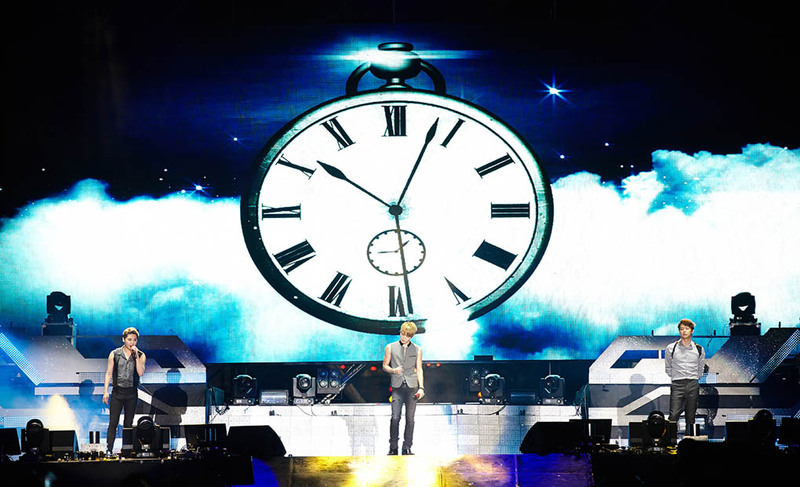 JYJ performed one cover song in Mandarin which was Eason Chan’s “Ten Years” in Beijing, Chengdu, Taipei and Shanghai. They specifically chose this song in line with their 10th anniversary since debut. JYJ performing “Empty” in Shanghai. Photo: C-JeS Entertainment. The introduction video showed a futuristic world, abstracts and several scenes of JYJ from the set of “Back Seat” music video. The scene panned into many hallways before the silhouettes of the three members were shown. 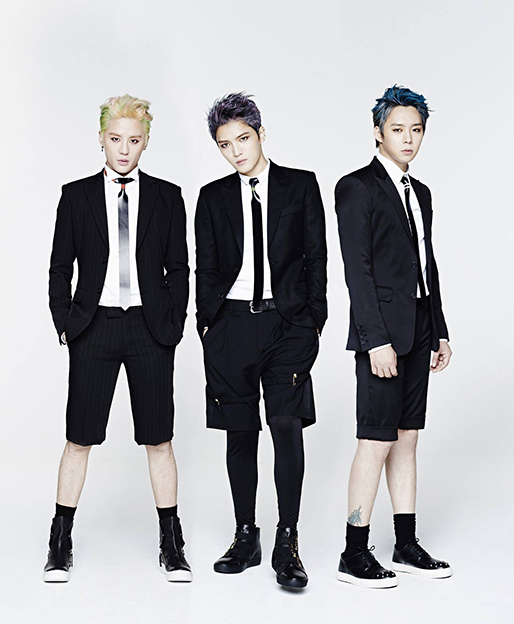 The video continued with each JYJ member in their grey outfit from “Back Seat” music video looking into the camera. It ended with a spinning three-dimensional JYJ logo and the members then altogether hitting a pose. The first interlude showed still images of the members’ childhood, photos posted from their Twitter, shots of the members in the recording studio, and the members’ live concerts and fan-meetings. The second interlude previewed mix concert footage from the group’s world tour concert, solo concerts and fan meetings. The clip later showed scenes of the members in the recording studio while their messages to fans being read out and displayed onscreen. The outro video revealed behind the scenes footage of Just Us album photo shoot, the making of “Back Seat” music video, and rehearsals for Just Us album showcase and concert in Seoul, while the credits being rolled onscreen, with “새벽 두시 반(Sad Dawn)” played in the background. The Hong Kong concert had much lesser distance for fans to come in contact with the trio than the stage in Seoul. During the press conference held in Taipei on September 11, 2014, approximately 50 reporters allegedly boycotted and left the event as a result of a reporter who was allegedly denied to take photos during the interview by the local organizer. C-JeS Entertainment later clarified on the following day that the issue was merely a miscommunication between the emcee and reporters. The agency told Osen that the reporters were only requested to minimize the use of flash photography. A few reporters later complained about the emcee’s comment and purportedly made the other reporters to leave. Towards the end of the conference, JYJ took some time to hold another round of photo session for the reporters who had returned despite giving their complaints. 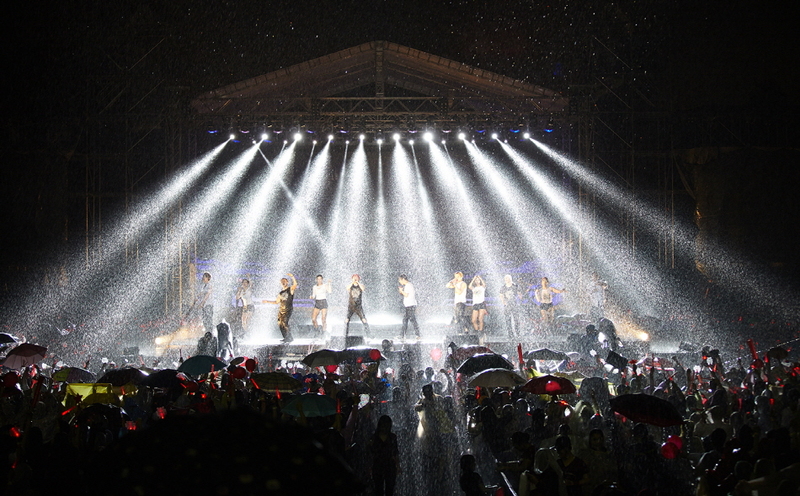 Heavy downpour during the encore of the Ho Chi Minh concert. Photo: C-JeS Entertainment. As removal of clothes and show of tattoos while on stage were strictly prohibited, the outfit for the trio throughout the Ho Chi Minh City show was changed. Despite heavy rain, the trio endured the occurrence during the encore and continued the show until the end. The concert crew had to cover and protect stage speakers under the rain as the concert was specially held outdoors to accommodate more fans. In Bangkok, there were certain seating adjustments made to some zones and the organizer, E-Intent, gave limited edition concert posters to fans of the affected zones as gifts. 400 fans were randomly chosen to attend an open press conference, which was held in Central World Department Store. The show was delayed and kicked off only half an hour later due to prolonged admission into the event hall. The Bangkok concert was the only show in the tour to introduce cart routes around the stage for the JYJ members to have better interaction with fans during “찾았다(Found You)”. The existing routes were initially planned to be only for both sides of stage, but the organizer later announced on September 24, 2014 that it would be extended all the way around the stage instead. Teaser poster for Seoul concert. Photo: C-JeS Entertainment. 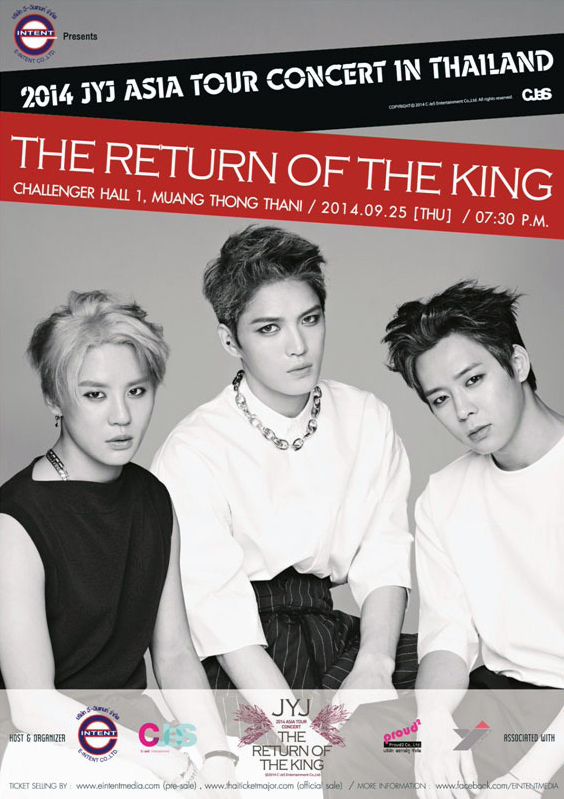 The first teaser poster for the tour was unveiled through JYJ Naver LINE account on June 26, 2014. A 20-second teaser was released on July 27, 2014 that showed snippets from “Back Seat” music video and concept photos for the Just Us album. The tour’s name and concert date for the show in Seoul were mentioned towards the end of the clip. The official tour posters were photographed during the Just Us album photo shoot. 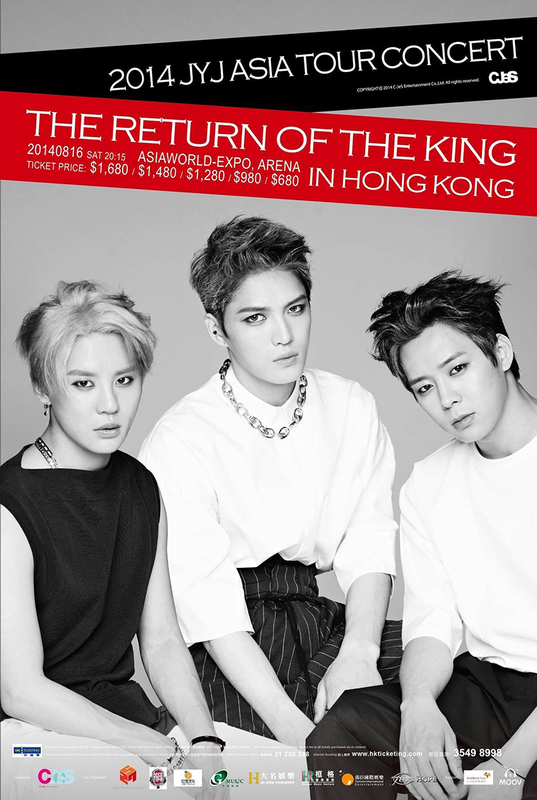 A different set of poster was also used in Hong Kong that resembled the teaser poster for the Seoul concert. For the Taipei concert, however, the promotional materials varied from the rest of the shows with changes on typography and photography. The August 2014 issues of Vogue, Vogue Girl, W Korea, Allure and Singles magazines featured one promotional page of JYJ’s Just Us album and the tour. JYJ bus wraps operated from July 28, 2014 till August 8, 2014 around the Northern and Southern part of Seoul to promote the tour. Various advertisements were made on local newspapers, and billboards in shopping malls and train stations to promote the Hong Kong show. The Seoul concert was filmed and released as a 4-disc live concert DVD on August 14, 2015. 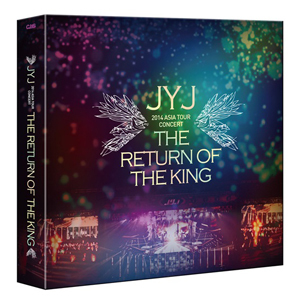 The third disc includes a concert making film, special angle footage and photo gallery of the Seoul concert. The fourth disc consists concert highlights of seven other Asian cities and their photo galleries. The DVD set comes with a 200-page photo book including 12 pages of 3D photos, and four pieces of group and individual mini posters. The Japanese edition was released on the same day and unlike the Korean edition, the Japanese edition has a different disc artwork. 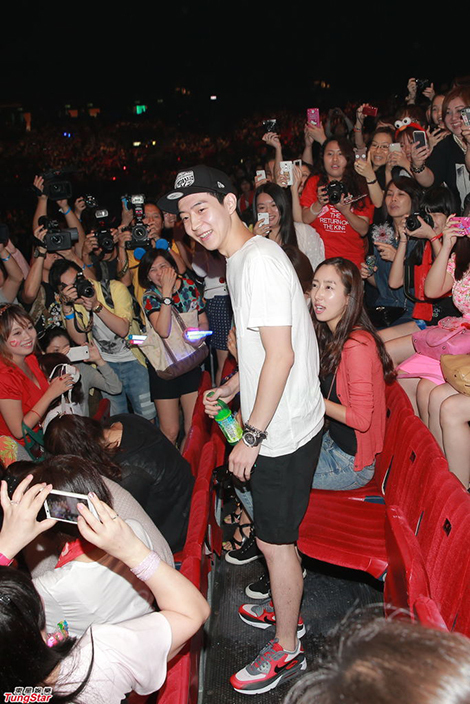 Park Yoo Hwan in Hong Kong show. Photo: TungStar. The first round of ticket sales for the Seoul concert was sold out with 20,000 seats in just 20 minutes on July 2, 2014. The show topped both Interpark’s best-selling concert charts for the week of June 30, 2014 to July 6, 2014, and for the month of July. The same show later made into the top 10 list of the highest-grossing concert in 2014 and JYJ was ranked at number-six. In Vietnam, the ticket site went down due to traffic overload just after three minutes of sales. This incident was considered one of the rare cases ever recorded in Vietnam for an international K-Pop show. Four out of ten VIP zones for the show were sold out within 20 minutes later on July 28, 2014. It was also reported that after five hours the start of sales, over 2,000 tickets were sold, an impressive figure for the current ticket sales situation in the Vietnam market. Each JYJ member’s families took turns to catch the shows in different cities in the tour. The trio was visited by Junsu’s brother, Kim Jun Ho, and Jaejoong’s sisters during the concert in Seoul. In Hong Kong, both Yoochun’s mother and brother, Park Yoo Hwan, attended the show but they had to leave before the show had begun after being found that fans had caused commotion. Junsu’s mother was also seen arriving for the concert in Ho Chi Minh City. More than 200 fans, press and medias filled the arrival hall at the airport in Hong Kong on August 15, 2014. The fans hung various placards around the airport, and local media reporters gathered to make reports about JYJ’s arrival. Fans were also reported to have trespassed into restricted zones to catch a glimpse of the JYJ members, and the issue was brought up by the members during the concert’s press conference. The crowd in Bangkok’s press conference. Photo: C-JeS Entertainment. 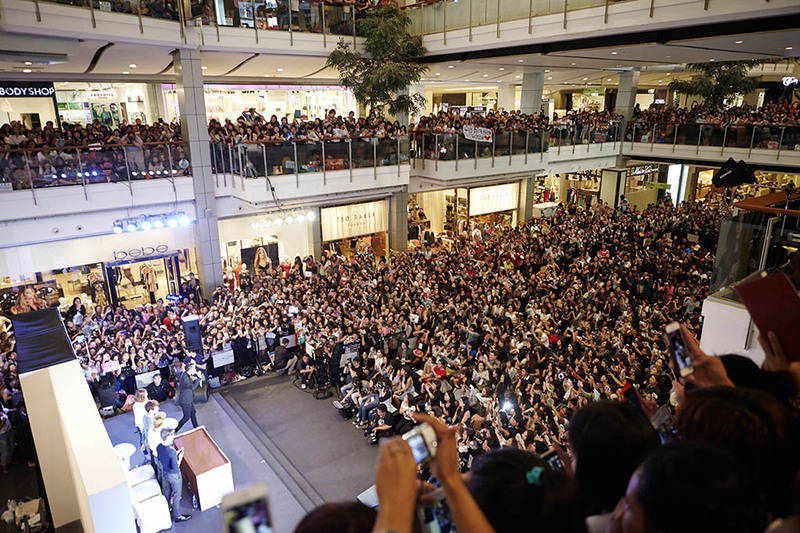 In Bangkok, over 3,500 fans turned up for the press conference in an open area of Central World Department Store. Among the crowd, 400 fans were chosen through a lucky draw to enter special fan zones, which was set up on both sides of the press conference stage. The selected fans had better privileges in seeing JYJ up-close while the trio was on stage. Many fans also gathered outside the mall in early morning to get a good view of JYJ. Besides the floor on the front of the stage, both first and second floors were filled with fans during the event on September 24, 2014. Promotional poster for 2014 Gangnam Hallyu Festival. Photo: Gangnam District Office. On September 5, 2014, C-JeS Entertainment announced that JYJ would be performing one night only at Gangnam District’s Yeongdong-daero in Seoul for the annual Gangnam Hallyu Festival, which was scheduled on October 5, 2014. The festival ran for four days from October 2, 2014 and JYJ adorned the finale. Organized by the Gangnam District Office and sponsored by Hyundai Motors, the street performance served as the Seoul encore of the The Return Of The King tour. The festival was JYJ’s first street performance in six years since TVXQ!’s fourth Mirotic album autumn mini concert and showcase in Seoul City Hall Plaza in 2008 before the split-up. 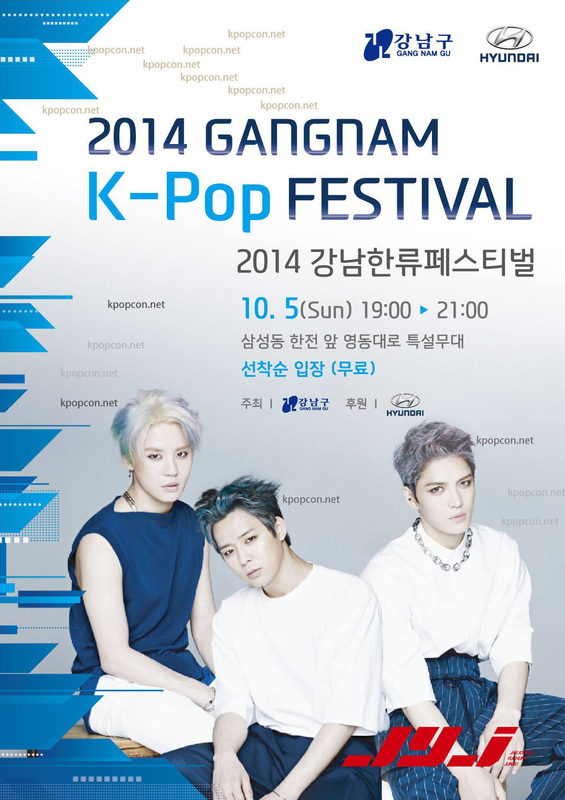 It was also titled as 2014 JYJ ASIA TOUR CONCERT GANGNAM HALLYU FESTIVAL. Unlike the shows in previous years, there were no special guests, meaning JYJ would be taking over the stage for approximately two hours. About 3,300 people from South Korea and abroad were expected to arrive for the exclusive free concert, but 50,000 fans turned up instead. JYJ performed without any appearance fee and the concert was held to globalize the K-Pop wave. All profits earned from souvenirs and merchandise proceeded to the Gangnam Welfare Foundation. JYJ rehearsed for the show in the afternoon of October 5, 2014. LOOK Korea was again the authorized dealer and travel agent for international and Japanese fans. The entire seven-lane road of Yeongdong-daero in front of the Korea Electric Power Corporation (KEPCO) headquarters was blocked off for the festival. Some fans arrived and camped out on site as early as October 3, 2014 since admission to the concert was on a first come, first serve basis. Citizens in their 40’s and 50’s also participated and cheered from the streets nearby. Reports also claimed to have seen both Junsu’s parents came to support the trio. JYJ performing “So So” in 2014 Gangnam Hallyu Festival. Photo: C-JeS Entertainment. The set list differed slightly to the The Return Of The King tour. The trio performed a total of 19 songs including three solo performances of favorite or self-composed songs per member. In addition to “Butterfly”, Jaejoong sang “화장(Make-Up)” and covered Lee Juck’s “하늘을 달리다(Running In The Sky)”. Junsu performed “사랑은 눈꽃처럼(Love Is Like A Snowflake)”, an original soundtrack from the Korean drama The Innocent Man, “Tarantallegra” and “Incredible”. Yoochun covered “너에게..기대(Leaning On You)” by Mate, sang his self-composed track “그녀와 봄을 걷는다(Walking With Her In Spring)” and “서른..(Thirty..)”. ● Be The One_Techno Ver. “Be My Girl” started off with the original version and continued with the remix version in the mid-part of the song. All of the merchandise sold on that day were entirely similar to the goods meant for the The Return Of The King tour in Bangkok with exception of the new blanket. This list is representative of the sales for 2014 Gangnam Hallyu Festival official goods. “Be The One_Rearranged” was removed from the set list in Beijing. “Turn It Up” was removed from the set list in Ho Chi Minh City and Bangkok. “찾았다” was removed from the set list in Hong Kong and Ho Chi Minh City. “찾았다” was replaced with “十年(Ten Years)” in Beijing, Chengdu, Taipei and Shanghai. “낙엽(Fallen Leaves)” was removed from the set list in Chengdu. Seoul concert goods. Photo: C-JeS Entertainment. Bangkok concert goods. Photo: C-JeS Entertainment. The sale of the merchandise for the concert in Seoul began at 10:20AM Korean local time on August 9, 2014. All merchandise were showcased and contained in a large display box outside the stadium. Two new additional items were introduced for the Taipei concert. The new merchandise were a group edition photo picket which was an unreleased photo from the Just Us album, and a black T-shirt with a golden artwork. In Shanghai, a group edition slogan towel, concert book, bag and poster were added into the list. The new slogan towel was a group edition, while the new black tote bag had an imprinted white artwork. Seven brand new design merchandise were only available exclusively for the Thailand leg which included two new heart-shaped red and white light sticks, slogan towel, big size towel, T-shirt, clear file set and big size cushion covers. Unlike previous designs, the new slogan towel and big size towel featured all the names of cities in the Asian tour to signify the concert finale. The artwork of the new white T-shirt was replaced with a golden color, and new unreleased photos from Just Us album were used for the new clear files. The new cushion cover was a group edition, while photo picket and black T-shirt were both of the same designs from the ones in Taipei. This table is representative of the sales in Hong Kong, Ho Chi Minh City, Chengdu, Taipei, Shanghai and Bangkok. A This concert was a part of the “2014 Gangnam Hallyu Festival”. This page was last modified on November 27, 2015. 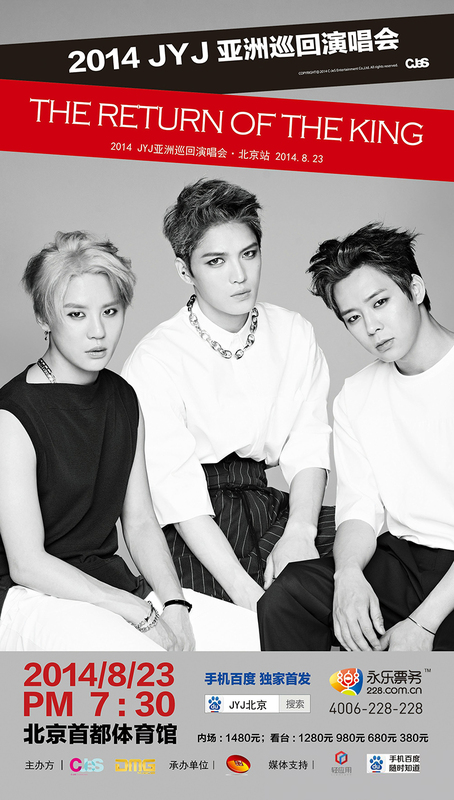 Is it known whether or not JYJ will tour in the USA this year to promote their new album “Just Us”? If so, which cities in the USA are they likely to hold concerts? 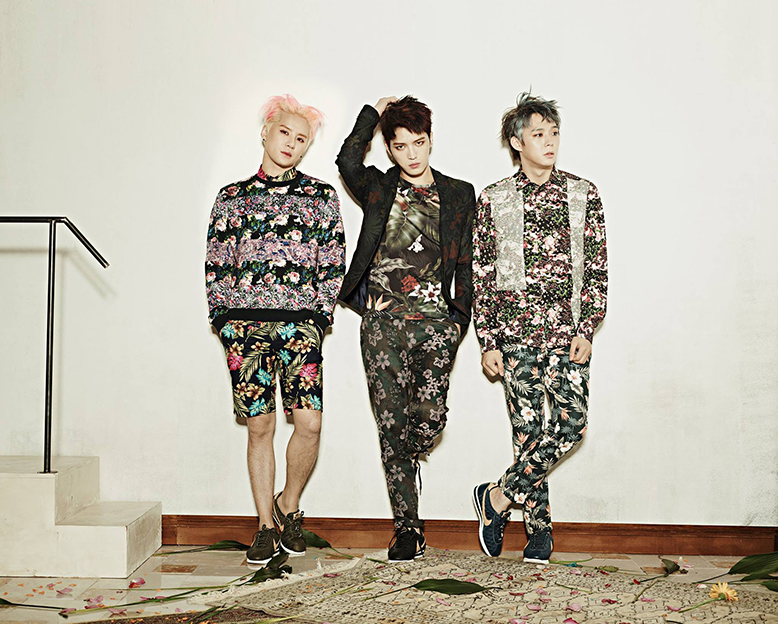 The JYJ members will only tour around Asia this time around to support their new second album. That’s very saddening and heartbreaking to learn. I was really hoping to see them in concert this year. I briefly though of trying to get tickets to see them in Tailand as its schedualed on my birthday but that just isn’t realistic for me right now. I suppose that eliminates the chances of them touring in USA at all before Kim Junsu and Kim Jaejoong enter into military service? It is rather unclear now if there’s a possible tour in the States before their enlistment, but the trio might tour in Japan towards the end of this year. 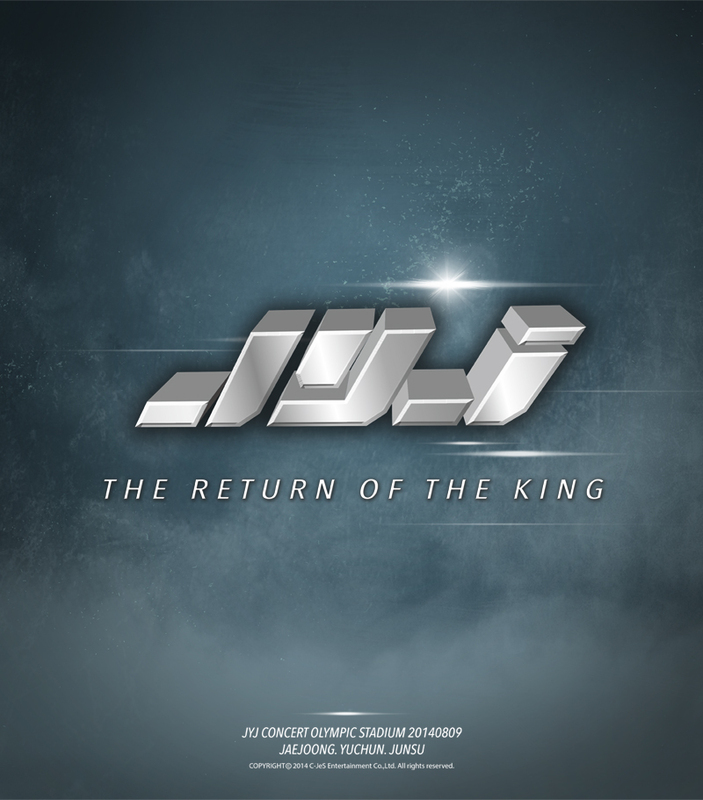 There isn’t any info if the Japan tour will be a part of this ‘The Return Of The King’ tour or a separate tour. I see, thank for the info and for taking the time to answer my questions. Sorry I misspelled “Thailand” previously. God willing JYJ will be able to go on a World Tour at some point and make it to the USA before their enlistment. I’m certain many fans all over the world would be ecstatic if a World Tour where made possible. The local Malaysian organizer announced that the Kuala Lumpur concert has been called off. May I know when is the JYJ concert ticket sales for KL? I am from Singapore. Thank you. Do you know when they will start the tix sell for Shanghai concert? Thanks in advance. We will update the details for the show in Shanghai as soon as we get more information. Till then, you can follow our site, Twitter or Facebook for instant updates. Since this is an Asia Tour, I was wondering if there are any chances that this concert will be held in Europe? I am from United Kingdom. There isn’t any word on a possible world tour for ‘The Return Of The King’ as of yet. The chances for the trio to hold a world tour concert are very slim. However, they might tour in Japan towards the end of this year. It’s saddening to hear that there is no Singapore and Malaysia :(. I really hope to see them because I already missed the concert in Viet Nam :(. Why they do not consider Singapore? The new photo picket was a group edition while the new T-shirt had a golden artwork on a black shirt. Since we could not obtain official photos from C-JeS Entertainment for the new items, we can only link you some shots taken by fans who purchased them. Hi, eh, can someone update the attendance at 11 Sept concert held in Taiwan – media reported 9000..
Error fixed and thank you for the correction. Is it possible for JYJ to perform in the Phillipines this year? We doubt JYJ will visit to the Philippines to hold their concert anytime this year. The ‘The Return Of The King’ tour has ended, by the way.